As more of our lives exist on mobile devices, it was only a matter of time before our identifications became digital as well. Louisiana State Representative, Ted James of Baton Rouge, had the foresight to put the wheels in motion for Louisiana to be the first state to offer a digital driver’s license. In 2016, Representative James’s HB 481 passed in the Louisiana Legislature under Act 625. While the Louisiana Legislature is great at passing laws, the state needed Envoc’s expertise to create the technology to house the digital driver’s license. Over two years, Envoc partnered with Chad Lacour and state officials to make LA Wallet Louisiana’s, and the United States’, first fully functioning digital driver’s license. While all new apps present unique and exciting challenges, a digital driver’s license demands the responsibilities of many legal regulations and restrictions. Our first priority was going to be to build a secure app that protected an individual’s rights and personal information. For many people, their entire life exists on their mobile device. A smartphone holds much more personal information than a plastic card. The Louisiana State Police stipulated that there should be a “no-touch” policy; at no time should an officer take possession of a citizen’s mobile device. This policy would not only protect from unlawful searches and seizures but would also protect a citizen’s personal property when presenting their digital driver’s license to anyone other than law enforcement. Additionally, the app required anti-forgery precautions, much like the holograms and hidden identifiers that protect physical licenses from being counterfeited. Finally, since the state would not be profiting directly from the operation and sale of the digital driver’s license, it was important that no other equipment, such as bar-code scanners, be required to use or verify the digital driver’s license. All of these challenges were for the user’s safety and security, and the Envoc team was poised to build an app to exceed all expectations. Everyone at Envoc was eager to work on this project because we knew it was a unique opportunity for both Envoc and the State of Louisiana. The first step involved working closely with the OMV and Louisiana State officials to learn and understand the laws and requirements, including several security components, multiple license classes, different license orientations, and user-specific properties. Once we were able to generate pixel-perfect digital licenses we moved on to creating the web application that serves as the mobile app’s backend. This application is used to manage and secure app data as well as provide a communication layer between the app and the backend. Once our API specifications were created we began creating the mobile apps. The iOS & Android apps were developed in parallel with the intention of launching them at the same time. The first milestone was finding a way for the app to display the high-resolution digital license securely without requiring network connection. Once that was accomplished, we added the ability to create and manage an LA Wallet account, as well as the ability to update the digital license once a physical license expires. The last major feature was implementing the in-app purchase for both iOS & Android. Once development was completed, we moved on to testing. Once all legal and technical components were built and tested by our team, we moved into a closed pilot where over 100 people tested the app on both the iOS and Android platforms for several weeks. After the pilot, we were certain LA Wallet would not only be the first operational digital driver’s license in the US, but it would be a truly exceptional app. 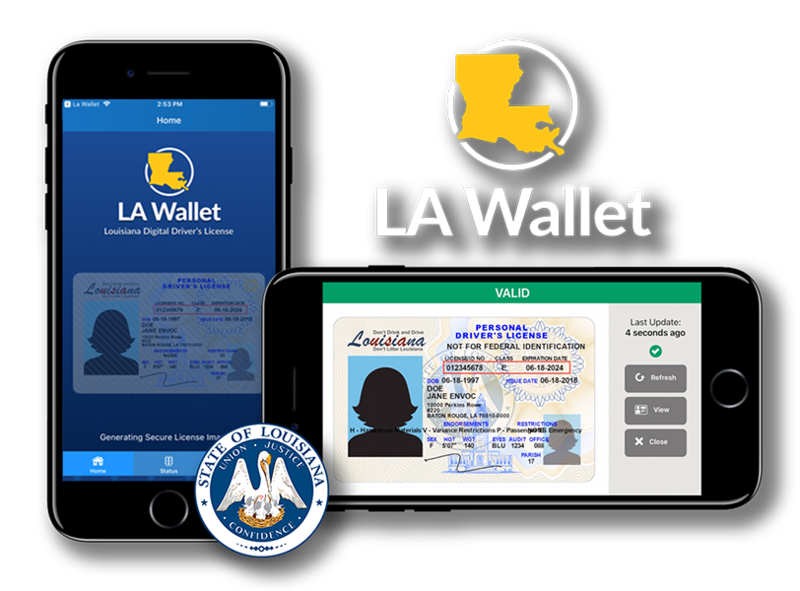 LA Wallet does not simply display an image of a physical Louisiana license. Instead, it obtains several image components and all license data from the OMV to create a unique high-resolution rendering of a Louisiana driver’s license. The digital license has all of the security features of a physical license as well as a few we’ve added ourselves. The app also needed to be able to continue working even when network connectivity is unavailable. Once a user initially retrieves their license information with a network connection, the app securely stores the digital license. The digital license is available anytime, even without a network connection. However, the app will inform the user that the information may potentially be out-of-date. The “No Touch” requirements dictated by State Police provided the team with an opportunity to create new functionality not typically required or requested for usual apps. Our developers created a simple yet effective touch-activated security feature. When requested to do so, a citizen can press and hold press and hold to display the security seal to validate authenticity. This is in place to prove that the data displayed on the screen is authentic and not simply a screenshot or recording. LA Wallet has received local and national media coverage, and we have heard from many eager citizens who are ready to use their digital license.